Halifax coach Richard Marshall was left to bemoan a string of wasted first half chances as his side slipped to a bewildering Championship defeat at Sheffield on Friday night. Fax dominated significant stretches of the opening 40 minutes, carving the defence open almost at will against Mark Aston’s full time side, with half back Gareth Moore and back rower Dane Manning always dangerous. But somehow the missed opportunities piled up as half time approached, with James Saltonstall’s disallowed try and Ben Johnston’s uncharacteristic hesitation in sight of the line leaving the game poised 0-0 at the break. The second half was a different story, with four tries in the opening 10 minutes of the half giving the Eagles a matchwinning 20-0 lead. “We bombed too many chances and that’s the difference,” said Marshall, whose side head to Workington in round three next Sunday. “We created six, seven, maybe even eight, clear opportunities to score in the first half. “There has to be some credit to Sheffield, for the way they scrambled and got bodies back to disrupt us, but we didn’t convert them. “We had all the momentum and you know that you only get so many opportunities to score in a half and you need to take them. “We just couldn’t get over the line, but it wasn’t for want of trying. 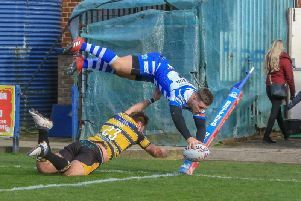 Marshall said he was “disappointed” with his side’s second half performance, which saw former Fax winger Rob Worrincy score twice as hulking centre Menzie Yere ran riot against an injured Sam Smeaton. “They did us on a couple of counter breaks and in and around the ruck,” said Marshall. “Sheffield are very dangerous after they score. “You need to be aware of that and they killed the game in that 10 minute spell. “You end up behind the posts, saying the same things to each other, and it can be a difficult cycle to break. “Sam was playing busted at that stage and they’ve some skilful, fit players there and they worked hard for each other. “We’ve got a disappointed bunch in there, but this is what we do, this is adversity.